You don’t typically think of Indianapolis, Indiana, USA as being in the same class as Paris and London. Nevertheless, in at least one respect, it is. Maybe Indy’s automobile heritage plays a role. The city is home to the Indianapolis 500, one of the world’s oldest and most well-know gasoline-powered car races. And now Indy is becoming a world leader in electric vehicle (EV) use. First, it created one of the world’s largest EV municipal car fleets. Now it just opened the first EV car-share system in the U.S. 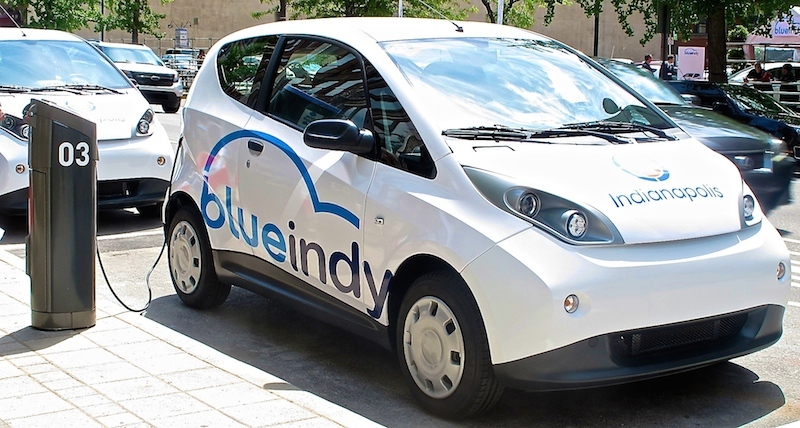 The BlueIndy program, which began September 2, joins similar existing Bluecar Autolib’ EV car-share services in Paris, Lyon and Bordeaux, and planned to open in London. EVs are far better for the environment than fossil fuel powered vehicles because they have no tailpipe emissions and their batteries can be charged using near-zero-pollution green electricity. BlueIndy memberships cost $9.99 per month, although for early adopters the initial six months are free. The first twenty minutes of driving costs $4 and after that the charge is $.20 per minute. Indianapolis Yellow Cab taxis charge a $3 pick up fee and $2 per mile plus $.65 for each passenger beyond the first. So except for trips under one mile, BlueIndy is more economical than gasoline-powered taxis and definitely more sustainable. The system is still being built out, however ultimately it should have 500 cars and 200 stations. Another positive story to share. Great example of innovation, sharing economy and sustainability.